Collierville, Tenn., Nov 27, 2016 —IPS® Corporation, the trusted leader in innovative plumbing solutions, announces the addition of the one-piece flexible waste & overflow with direct drain as well as direct drain half kits to the AB&A™ line. The new one-piece assembly is available in multiple pipe lengths to fit any tub, and ships preassembled with no trimming required for a faster, easier installation. The direct drain configuration is ideal for use in installations where baths are installed back to back, such as apartments, hotels and condominiums. 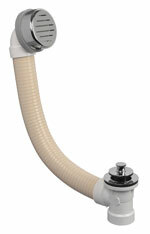 The direct drain tee is offered in one-piece flex full kits, a variety of half kits, and separately as an accessory. Both new products are available with the Classic high-flow overflow cover plate, the preferred choice of contractors. Classic’s slotted design provides greater drainage through the tub overflow, allowing water to drain from the overflow at twice the rate of most commercially available overflows. As always with Classic, installers can easily secure the overflow elbow, gasket, and cover plate to the tub without the use of a screwdriver or screws and a test kit is included in every rough-in, half, or full kit. Please visit http://bit.ly/1-PCFLEX or call Customer Service at 800-888-8312 for more information on this product. IPS® Corporation is the leading manufacturer of solvent cements, primers and sealants for all markets and applications – plumbing and roofing products – as well as structural and assembly adhesives. In the US and around the world, specifiers, contractors, pipe-fitter, plumbers and fabricators choose our professional grade products for their proven superior reliability, innovative features and performance, which save time and offer unmatched guarantee of first-time right and longer service life. More information is available at www.ipscorp.com.